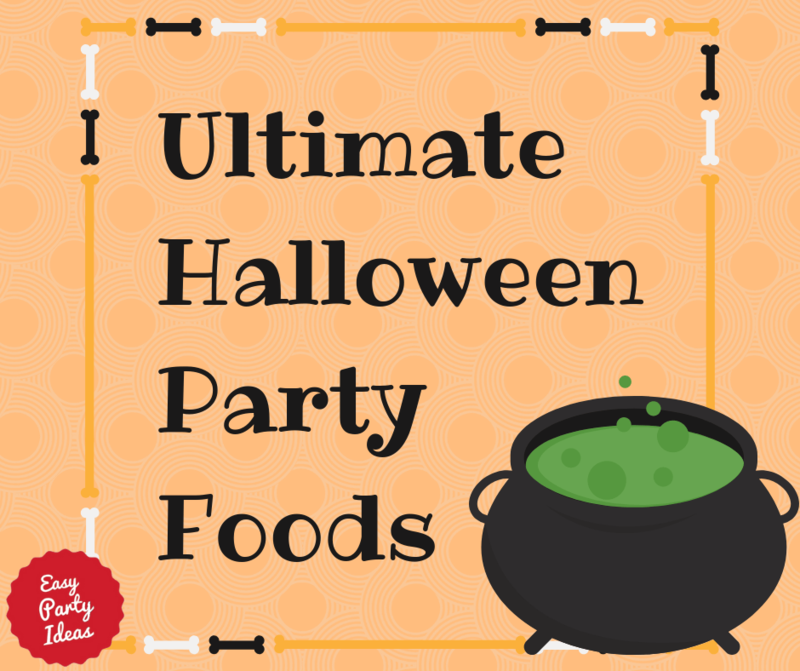 We’ve got a list of Halloween party foods and snacks to go along with all your great Halloween party ideas! Serve finger sandwiches that have been cut into Halloween shapes with Halloween cookie cutters as a fun Halloween party food. Set your table in Halloween colors – orange and black, maybe some white (for ghosts) and purple too…and then include food in those colors. Halloween party appetizers in Halloween colors could include Cheetos, baby carrots, cheese cubes, cantaloupe, dark grapes and dark breads (rye) along with light. 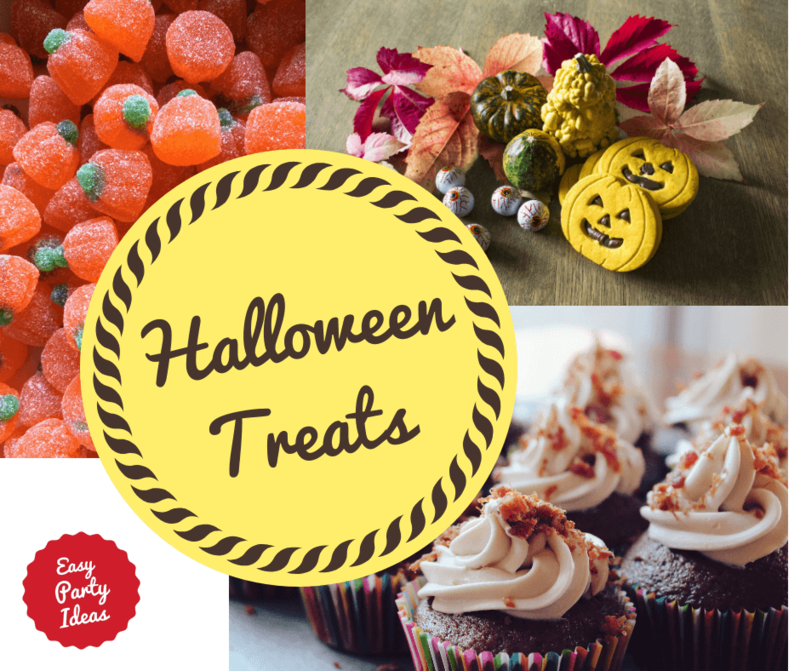 Include Halloween candy on your table (not just for a child food Halloween party!) such as candy pumpkins, candy corn, black licorice…anything you like! Talk about great Halloween party treats!! If you have plenty of prep time before the party, one of our favorite Halloween party appetizer ideas is to use cookie cutters to cut pumpkins out of slices of cheese to serve crackers. An adult Halloween party recipe that I love to serve is a pumpkin dip with ginger snap cookies. For a cute presentation, serve the dip in a small hollowed out pumpkin! Create spider treats by inserting eight pretzel sticks (four on each side) into the filling of Ritz peanut butter crackers. With a dab of peanut butter, set two raisin “eyes” on top. Serve Witch's Hats by placing a ball of ice cream on a plate, topped with a chocolate covered cookie with an ice cream cone (chocolate dipped!) on top. Not just a halloween party food, make up a batch of Halloween Trail Mix. 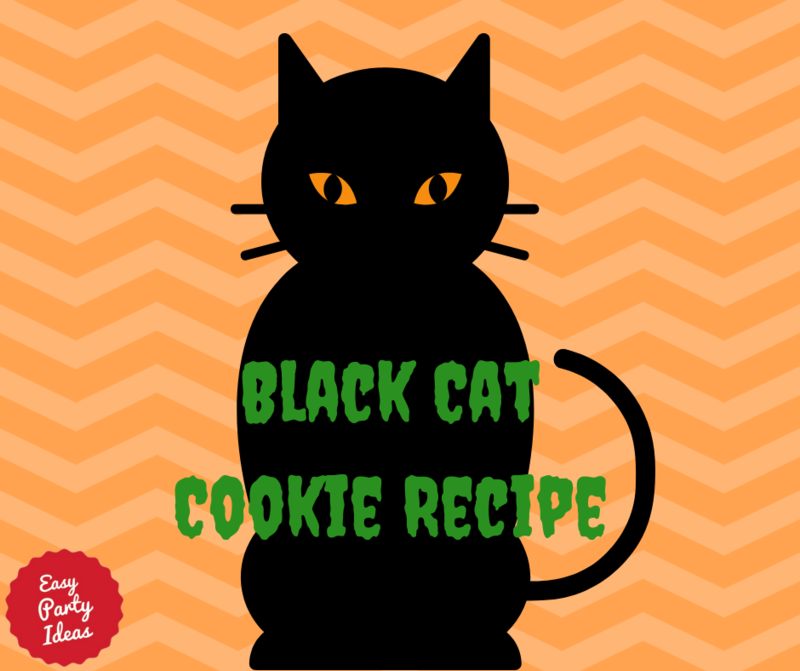 Kids and adults will both love Black Cat Cookies. Beat together peanut butter, water and eggs. Gradually add cake mix. Mix well. Form into 1 1/2" balls and place on cookie sheet. Flatten with bottom of a glass dipped in sugar. Pinch 2 "ears" at top of cookie. Press a fork into dough to form whiskers on either side of the nose. Bake for 10-12 minutes. Remove from oven and immediately add candy corn eyes and M&M's or a red hot for the nose. Makes 3 dozen. Serve roasted pumpkin seeds. Wash and pat dry your pumpkin seeds, then toss with vegetable oil (2 to 3 tablespoons per cup of seeds). Spread seeds onto a cookie sheet, sprinkle with salt and bake 20 to 30 minutes until seeds are lightly browned and crispy. Yum! 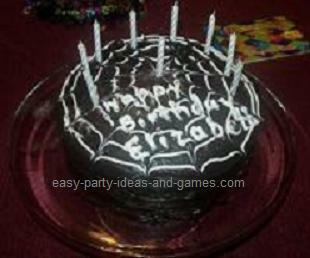 Convert any party food into Halloween party recipes by adding some decorations. Chips and dips become fun when you add plastic spiders to the rim of the bowl. Instant Halloween party snacks! 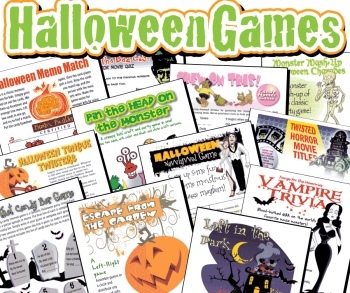 For munching all this fun party food, play some Printable Halloween Games - it makes planning your party oh so easy! A fun Halloween party punch is to fill a punch bowl with favorite drink (how about some red Kool-aid?) and let plastic spiders or bugs float in it. Turn any punch into Halloween party drinks by floating dry ice near the punch. A creepy, bubbling punch is a great touch!! Remember that dry ice should not be touched. If there are children at the party make sure that dry ice is out of reach. 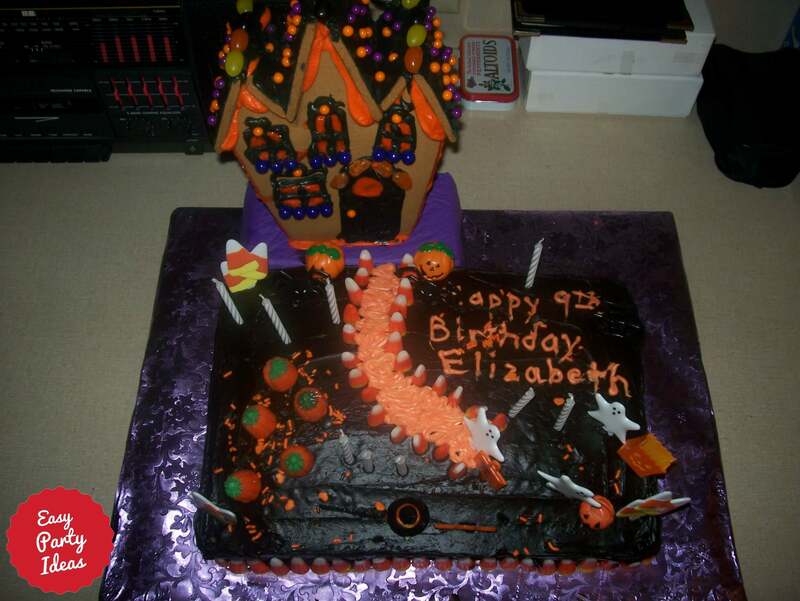 No list of Halloween party recipes is complete without mentioning Halloween Cakes, such as a spider web or haunted house design! Click on the following for more great Halloween party ideas!